Quantum dot light-emitting diodes (QD-LEDs) have attracted considerable interest for their wide-range of color tunability, high brightness, and good color purity due to their quantum confinement effect. However, challenges remain in achieving the necessary multilayer device structures using printing processes for display applications. Many printing technologies need to be employed to build multi-stacking patterns and devices. For the first time, QD emitting layers were printed by electrohydrodynamic (EHD) jet spray technology and applied to all solution-processed QD-LEDs except for the electrodes. The QD-LEDs have a structure of ITO/PEDOT:PSS/PVK/EHD-sprayed QDs/ZnO/Al. The sprayed QD patterns were controlled with various parameters to obtain uniform surface morphology. The optimized QD-LED device showed a luminance of 5154 cd/m2 and a current density of 2.18 cd/A, and EQE of 1.47%. V. L. Colvin, M. C. Schlamp, and A. P. Allvisatos, “Light-emitting diodes made from cadmium selenide nanocrystals and a semiconducting polymer,” Nature 370(6488), 354–357 (1994). P. O. Anikeeva, J. E. Halpert, M. G. Bawendi, and V. Bulović, “Quantum dot light-emitting devices with electroluminescence tunable over the entire visible spectrum,” Nano Lett. 9(7), 2532–2536 (2009). J. Zhao, J. A. Bardecker, A. M. Munro, M. S. Liu, Y. Niu, I.-K. Ding, J. Luo, B. Chen, A. K.-Y. Jen, and D. S. Ginger, “Efficient CdSe/CdS quantum dot light-emitting diodes using a thermally polymerized hole transport layer,” Nano Lett. 6(3), 463–467 (2006). K. S. Cho, E. K. Lee, W. J. Joo, E. Jang, T. H. Kim, S. J. Lee, S. J. Kwon, J. Y. Han, B. K. Kim, B. L. Choi, and J. M. Kim, “High-performance crosslinked colloidal quantum-dot light-emitting diodes,” Nat. Photonics 3(6), 341–345 (2009). V. Wood, M. J. Panzer, J. Chen, M. S. Bradley, J. E. Halpert, M. G. Bawendi, and V. Bulović, “Inkjet-printed quantum dot–polymer composites for full-color ac-driven displays,” Adv. Mater. 21(21), 2151–2155 (2009). C. Jiang, L. Mu, J. Zou, Z. He, Z. Zhong, L. Wang, M. Xu, J. P. Wang, J. Peng, and Y. Cao, “Full-color quantum dots active matrix display fabricated by ink-jet printing,” Sci. China Chem. 60(10), 1349–1355 (2017). P. Kathirgamanathan, L. M. Bushby, M. Kumaraverl, S. Ravichandran, and S. Surendrakumar, “Electroluminescent organic and quantum dot LEDs: the state of the art,” J. Disp. Technol. 11(5), 480–493 (2015). L. Kim, P. O. Anikeeva, S. A. Coe-Sullivan, J. S. Steckel, M. G. Bawendi, and V. Bulović, “Contact printing of quantum dot light-emitting devices,” Nano Lett. 8(12), 4513–4517 (2008). T. H. Kim, K. S. Cho, E. K. Lee, S. J. Lee, J. Chae, J. W. Kim, D. H. Kim, J. Y. Kwon, G. Amaratunga, S. Y. Lee, B. L. Choi, Y. Kuk, J. M. Kim, and K. Kim, “Full-colour quantum dot displays fabricated by transfer printing,” Nat. 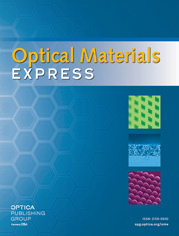 Photonics 5(3), 176–182 (2011). S. H. Park, J. Kim, C. E. Park, J. Lee, H. S. Lee, S. Lime, and S. H. Kim, “Optimization of electrohydrodynamic-printed organic electrodes for bottom-contact organic thin film transistors,” Org. Electron. 38, 48–54 (2016). C. Li, S. Novak, S. A. Denisov, N. D. McClenaghan, N. Patel, A. Agarwal, K. Richardson, and W. Deng, “Electrospray deposition of quantum dot-doped Ge23Sb7S70 chalcogenide glass films,” Thin Solid Films 626, 194–199 (2017). J. Xie, J. Jiang, P. Davoodi, M. P. Srinivasan, and C. H. Wang, “Electrohydrodynamic atomization: A two-decade effort to produce and process micro-/nanoparticulate materials,” Chem. Eng. Sci. 125, 32–57 (2015). S. Khan, Y. H. Doh, A. Khan, A. Rahman, K. H. Choi, and D. S. Kim, “Direct patterning and electrospray deposition through EHD for fabrication of printed thin film transistors,” Curr. Appl. Phys. 11(1), 271–279 (2011). M. N. Awais, H. C. Kim, Y. H. Doh, and K. H. Choi, “ZrO2 flexible printed resistive (memristive) switch through electrohydrodynamic printing process,” Thin Solid Films 536, 308–312 (2013). S. Ali, J. Bae, K. H. Choi, C. H. Lee, Y. H. Doh, S. Shin, and N. P. Kobayashi, “Organic non-volatile memory cell based on resistive elements through electro-hydrodynamic technique,” Org. Electron. 17, 121–128 (2015). S. E. Park, J. W. Park, and J. Hwang, “Morphology characterization of phenyl-C61-butyric acid methyl ester films via an electrohydrodynamic spraying route,” Thin Solid Films 550, 395–403 (2014). Y. G. Lee and W. S. Choi, “Electrohydrodynamic jet-printed zinc-tin oxide TFTs and their bias stability,” ACS Appl. Mater. Interfaces 6(14), 11167–11172 (2014). Y. J. Kwack and W. S. Choi, “Electrohydrodynamic jet printed indium–zinc–oxide thin-film transistors,” J. Disp. Technol. 12(1), 3–7 (2016). B. H. Kim, M. S. Onses, J. B. Lim, S. Nam, N. Oh, H. Kim, K. J. Yu, J. W. Lee, J. H. Kim, S. K. Kang, C. H. Lee, J. Lee, J. H. Shin, N. H. Kim, C. Leal, M. Shim, and J. A. Rogers, “High-resolution patterns of quantum dots formed by electrohydrodynamic jet printing for light-emitting diodes,” Nano Lett. 15(2), 969–973 (2015). D. Sun, M. Wong, L. Sun, Y. Li, N. Miyatake, and H. J. Sue, “Purification and stabilization of colloidal ZnO nanoparticles in methanol,” J. Sol-Gel Sci. Tech. (Paris) 43, 237–243 (2007). Y. S. Ka and W. S. Choi, “Optimization of organic–inorganic CTLs for solution-processed quantum dot light emitting diode,” J. Nanosci. Nanotechnol. 17(5), 3188–3193 (2017). Fig. 1 Diagram of the EHD jet printing system. Fig. 2 (a) QD-LED device structure and (b) photograph of QD-LED devices. Fig. 3 Effect of the applied voltage on the surface shape of the cone-jet at a constant flow rate of 0.016 µl/ sec. Fig. 5 Effect of the nozzle position with changing Z-gap, (a) 25 mm, (b) 20 mm, (c) 15 mm, and (d) 10 mm at constant voltage and flow rate. Fig. 6 Surface characteristics of EHD jet-sprayed QDs at constant XYZ, and voltage and different flow rates. (a), (b): 2D microscope images. (c), (d): 3D images at speed of 0.016 and 0.032 μl/sec, respectively, using NanoSystem WSI Measurement. Fig. 7 Optical microscopy images of QD thin films sprayed on PVK patterns at a constant X, Y: 2,400 µm with different flow rates. Fig. 8 J-V-L graph of QD-LED devices with various X, Y: (a) speed 0.016 µl/sec, (b) speed 0.0256 µl/sec, (c) speed 0.032 µl/sec. Fig. 9 (a) EL peak and illuminating QD-LED (inserted picture), (b) CIE color coordinates of the QD-LED sample with maximum luminescence. Table 2 Summary of the optical and electrical properties of QD-LEDs with various conditions of EHD jet spraying. Summary of the optical and electrical properties of QD-LEDs with various conditions of EHD jet spraying.